KYIV. 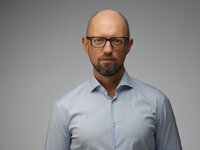 Dec 6 (Interfax-Ukraine) - People’s Front party leader Arseniy Yatseniuk has filed a lawsuit to Kyiv's Solomiansky district court against blogger Oleh Torhalo who on November 30 published a blog about purchase of 24 villas in Miami (the United States) by Yatseniuk in the Obozrevatel online publication. "I declare that I have never owned neither movable nor immovable property outside Ukraine: I do not have accounts in foreign banks. I do not have any relation to foreign companies. I am not the owner or ultimate beneficiary of companies registered outside our state," Yatseniuk wrote on his Facebook page on Monday. He said that he is Ukrainian citizen and he has never had citizenship of another state. He did not receive the right to permanently reside at any country. "I demand acknowledgement that this information is false and oblige the author of this fake news to deny it within 10 calendar days from the moment of the court ruling becoming effective in same manner that it was disseminated," he said. Yatseniuk also published a copy of his appeal on the Facebook.